With enticing turquoise waters and summer-like temperatures year-round, there is little wonder that The Bahamas is a paradise for water sports enthusiasts. From yachting, sailing and kayaking to scuba diving, sport fishing and snorkelling, the opportunities to play on The Bahamas’ crystalline waters are endless. With water temperatures averaging 80oF year-round, it’s ideal for any kind of water sport and The Bahamas is quickly becoming renowned as a top locale for one of today’s most popular water sports: kiteboarding. 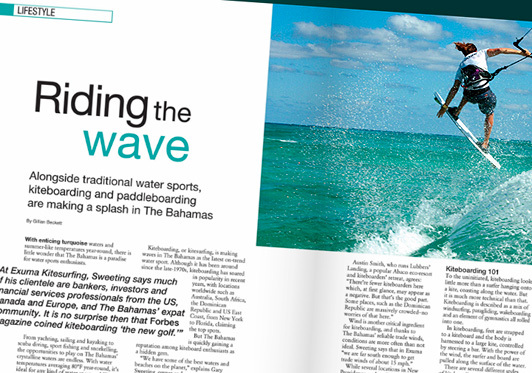 Kiteboarding, or kitesurfing, is making waves in The Bahamas as the latest on-trend water sport. Although it has been around since the late-1970s, kiteboarding has soared in popularity in recent years, with locations worldwide such as Australia, South Africa, the Dominican Republic and US East Coast, from New York to Florida, claiming the top spots. But The Bahamas is quickly gaining a reputation among kiteboard enthusiasts as a hidden gem. To the uninitiated, kiteboarding looks little more than a surfer hanging onto a kite, coasting along the water. But it is much more technical than that. Kiteboarding is described as a mix of windsurfing, paragliding, wakeboarding and an element of gymnastics all rolled into one. In kiteboarding, feet are strapped to a kiteboard and the body is harnessed to a large kite, controlled by steering a bar. With the power of the wind, the surfer and board are pulled along the surface of the water. There are several different styles of kiteboarding depending on levels of experience. The most popular is freeriding, which includes everything from simply gliding across the water and skimming waves to catching air. More experienced kiteboarders opt for freestyle, which can involve a variety of airborne jumps, spins and tricks by controlled flying. But like most extreme sports, kiteboarding carries an element of risk, and caution must be exercised. Such hazards to consider include getting lofted by strong winds, equipment failure, collisions, physical stressors such as fatigue and sunburn and even encounters with marine life such as jellyfish, sea urchins and, on the rare occasion, sharks. “There’s a reason experienced kiteboarders make it look easy,” Sweeting says, stressing that lessons from expert, certified instructors are essential. Sweeting himself is an IKO (International Kiteboarding Organization) and PASA (Professional Air Sports Association) certified instructor. And even with his background as an expert windsurfer and snowboard instructor, Sweeting says it took upwards of five years to master kiteboarding tricks. Kiteboarding requires skill, dedication and a sense of adventure, which may explain the growing numbers of white-collared professionals who are flocking to take up the sport. Go-getters such as Google founders Sergey Brin and Larry Page, and Virgin entrepreneur Richard Branson are known to be avid kiteboarders. In 2010, Brin successfully completed a challenge to kiteboard 40 miles through San Francisco Bay from the Golden Gate Bridge to the Dumbarton Bridge. Branson had also tried to set a record, kiteboarding across the English Channel on his 60th birthday, but was unsuccessful due to poor weather. 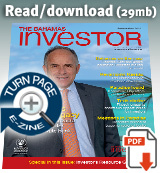 At Exuma Kitesurfing, Sweeting says much of his clientele are bankers, investors and financial services professionals from the US, Canada and Europe, and The Bahamas’ expat community. Since its resurgence in the 2000s, global interest in kiteboarding has grown exponentially. According to the International Kiteboarding Association (IKA), as of 2012, estimates show approximately 1.5 million kiteboarders worldwide and the global market of kite equipment sales is pegged at a worth of $250 million. Efforts have also been made to establish kiteboarding as a recognized Olympic sport. In 2012, course racing style kiteboarding was announced as an official Olympic sport for this year’s Summer Olympics in Rio de Janeiro, Brazil, replacing the windsurfing event. However, the International Sailing Federation (ISAF) reversed its decision, bowing to pressure from global windsurfing organizations. The ISAF will continue its bid to include kiteboarding at the 2020 Olympic Games in Tokyo. Meanwhile, kiteboarding will be included as one of four sailing events at the 2018 Youth Olympic Games in Buenos, Argentina. With kiteboarding taking a global foothold, Bahamas water sports operators and resorts are recognizing its niche market potential in destination tourism. At Lubbers’ Landing, a 13-acre island retreat overlooking Abaco’s Tilloo Cut, Smith sees a growing clientele of kiteboarders each year, most of whom travel from the US. Since opening in 2008, business at Lubbers’ Landing is booming. So much so, that Smith is branching out into his next endeavour, The Quarters, a development that offers island homes with quarter-share fractional ownership. Sweeting says Exuma Kitesurfing, which also offers stand-up paddleboard instruction and tours, hosted a corporate retreat recently with up to 18 people taking to the water on paddleboards. “It didn’t take long before all of them were paddling,” he says. “Everyone had a really great time and it’s an incredible core workout.